There is something about this book, it’s not grounded in scientific research but it’s simple concept resonates with everyone I’ve recommended it to. One of those people, a senior police officer, went on to buy everyone in her team a copy. The authors of the book have a background in sports coaching and apply the ideas they have worked with to what they call the ‘corporate the athlete’. You can see this in the way they talk of a new paradigm of full engagement, where energy, not time is managed, where stress is sought out, downtime is productive, purpose drives performance and life is viewed as a series of sprints, not a marathon. I can hear the sound of raised eyebrows but I encourage you to keep going. If you are interested in increasing your resilience toolkit I believe there are some gems in this book. 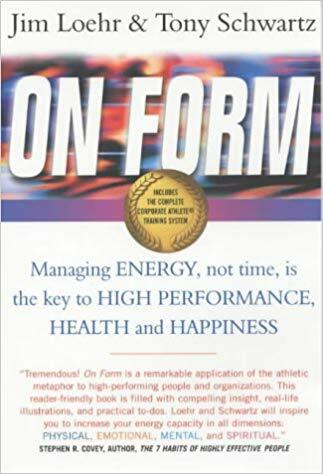 On Form uses the lens of four energy sources (physical, emotional, mental and spiritual) to provide practical guidance on diagnosing areas for improvement and identifying the changes in behaviour (rituals) that the authors believe can help you achieve increased energy, performance and success. As a psychologist who aims to take an evidence-based approach does it bother me that the premise of the book has not been thoroughly researched and tested? Yes and No. Will it make you think? Will it provide a different perspective? Might reading it improve your life? Maybe. For me the important thing is that we have an awareness of the basis behind an approach, are able to question the assumptions and claims being made and can therefore make an informed judgement about it’s usefulness to our lives. From a personal perspective this is a book that I keep coming back to. It has massages about resilience that benefit from rereading. For me the key takeaway is the importance of managing my energy and the reminder that resting and renewing isn’t being weak or lazy (a brief insight into my upbringing), it’s exactly what athletes do in order to perform at their best when they need to.